1. 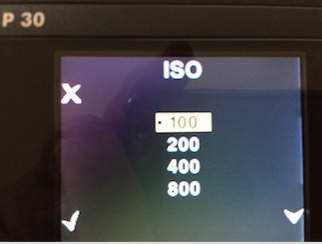 I can't find the ISO 50 setting in the ISO Menu. Is there a reason for that? 2. Where can I find the latest Firmware version and HOW to load it without a fireWire connection? It does not feed my needs, the firmware is not for the P30......... and I thought there is a P30 manual not formthe whole P Series. Anyway to load the new firmware WITHOUT a firewire connection is also needed because Firewire is NOT coomon anymore, especially on a mac. You do have the latest firmware in the camera back so no firmware update is needed. The 30mp sensor in the P30 has 100 as base ISO due to its use of microlenses on each pixel so essentially ISO 100 on P30 has the same quality as ISO 50 on a P45. Ulf wrote: You do have the latest firmware in the camera back so no firmware update is needed. The manual is generic for the "P" series. 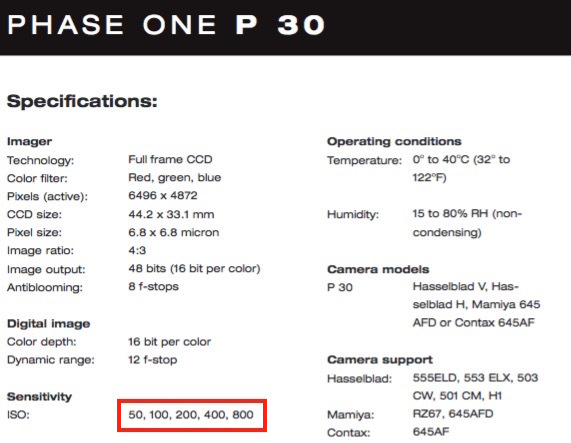 P20, P25 and P45 has base ISO 50 while P21 and P30 have ISO 100 as base ISO. Note how the menu shows ISO 400 as top level while you back has ISO 800 for that very reason. Why say's the Data sheet something different??? Not sure where that comes from, it is wrong. Sorry in fact this sounds not very serious! Firmware updates are not supported when using the Apple Thunderbolt adapter. The update itself will fail, but the back can be recovered by updating the firmware on another computer with a direct firewire connection. For IQ backs we recommend updating via USB or CF card. For all other backs please use a computer with firewire ports. It is a older product, not easy for a Phase One partner to keep information on a 12 year old product. I am sure they can tell you the data specs of a current products easily. I will leave this thread as it is after all a user to user forum.